You don’t see a lot of emphasis on grandma love in Disney films. Julie Andrews as a grandma and a Queen in The Princess Diaries was a treat, as well as outstanding casting, in my opinion. Given my own love for my grandmother, the love between Moana and her Gramma Tala really touched my heart. Gramma Tala understood Moana in a way that only a grandmother can. 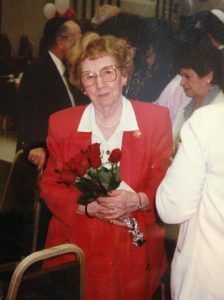 She provided insight, advice and guidance, as well as perspective and grounding in family. She understood Moana for who she was and for who she could be. For me, their relationship was probably the most meaningful part of the film, and the quote, “There’s nowhere you could go that I won’t be with you” has stayed with me. I, too, shared a uniquely special relationship with my Grandma. Last week was 20 years since she left this world, and I related to Moana’s pain as she had to let go of her Gramma. My grandmother loved being called Grandma, and said it was the greatest honor to be a grandmother. So, throughout this post I will simply call her Grandma. I grew up in a house with Grandma, in the same house that she raised my mom and her siblings. There were a lot of memories in that house, a lot of dreams, a lot of happiness, but also sadness. I grew up in that house but my mom and Grandma died in that house. Grandma and I were very attentive to each other, always calling each other and spending many weekends together. When she was ill I helped with her caregiving, and although I was not her primary caregiver, I was the one she relied on for comfort. At the same time, she wanted to protect me from the fact that she was dying. From the time I was a child, I was in awe of Grandma and her elegance. I loved her sense of fashion. She had a wonderful way of putting together colors and fabrics and styles. I still have some of her clothing and jewelry. The best shopping I ever did was in her closets and drawers. When I’m feeling lazy about dressing up or putting on make-up- it happens rarely, but it happens!- I hear her warning me that I never know who I am going to meet and I should always look my best. Clearly, she was hoping for a nice, Jewish Prince Charming. My fairytale was not quite exactly her idea of the “tale as old as time,” but Grandma always seemed to understand that I danced to my own beat. Sometimes we frustrated each other, particularly when I challenged her ideas of an ideal life. But, we had a special bond and an unconditional love for each other. Grandma had four brothers and a sister, my great-aunts and great-uncles, and I loved them all dearly. If you read my Valentine’s Day post, these are the wonderful people for whom I made cards when I was growing up. I accompanied my mom and Grandma to visit my great-grandmother at the nearby nursing home almost every day when I was quite young. As a child, it was a fun experience for me because, as I realized in retrospect, the people living there were so happy to see and interact with a child. I loved spending time with my great-aunts and great-uncles. Losing Grandma and my older relatives left a huge void in my life. However, through our loving relationships, I developed an appreciation of and particular compassion for elderly people that I have to this day. 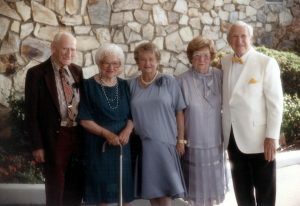 (L-R) Great-uncle Louie, Great-aunt “Tanta” Rosie, Great-Aunt Lillian, Grandma, Great-Uncle Larry. Mid-1980s. I adored them all. Grandma was very artistic and I inherited her abilities and passion for crafts. 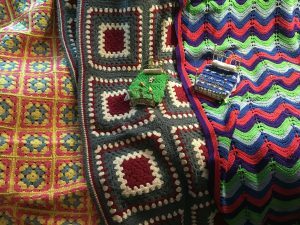 She crocheted many aphgans and sweaters, skirts, dresses and ponchos. I remember choosing wool colors with her and how each item had to represent the gift recipient, yet had to be timeless and classic. I can see my own shifting tastes as I look at my childhood aphgan in its pastel colors and then the gray, maroon and cream colors in my college aphgan. I remember waking up in the morning covered with the squares she made while I was asleep. My dollhouse and dolls even got aphgans! I still have many things that she made. 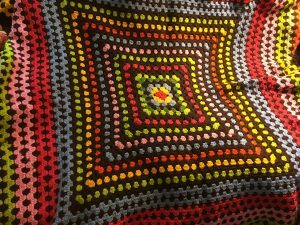 They hold such beautiful memories of time spent watching her and learning how to crochet. Eventually, she helped me to make an aphgan of my own. Ben used it often. Some of Grandma’s aphgans. Far left was from my bedroom, the middle was for college and far right was another design she made for another room. When I woke up, I would often find little aphgans in my dollhouse! I’ve kept them, too. The aphgan I made with help from Grandma. 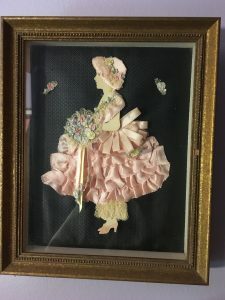 Grandma was also a craftsy child, and I remembering discovering and being fascinated by a beautiful ribbon doll that she made when she was young. My mom had it restored and framed, and it hangs in my apartment, another reminder of the artistic sensibility that I share with Grandma. Grandma’s talents extended to the piano, and she inspired me to learn how to play. I never played as well as she did, but she helped and encouraged me to play, and I’ve kept some of the sheet music. A ribbon doll that Grandma made as a child. I believe that these were popular crafts when she was young. My mom, on the other hand, was not artistic. 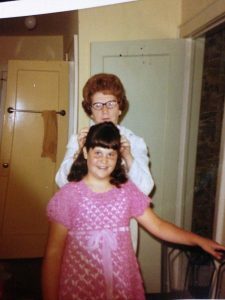 Grandma did my hair, helped me pick my clothes and taught me how to bake. I never saw Mommy approach the piano, though she did take guitar lessons with me for a very short time. 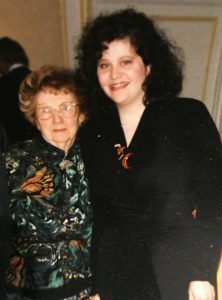 But, as I’ve written previously, my mom and I shared a sense of whimsy and we were both children at heart. Grandma did not share that sensibility and it made for some amusing times. One of my funniest memories was watching “The Little Mermaid” with both of them, my mom and I giggling like little girls, and then laughing hard as we looked at Grandma, who was staring at the screen in disbelief that we could lose ourselves in the film. OK, so Grandma did not embrace the Disney magic, but she did have a healthy respect for Mickey and Minnie and was amused and enthusiastic when I called her from Walt Disney World to tell her that I’d gotten a Happy 35th Birthday hug from Mickey! One of our traditions was to make humentashen, the triangular, fruit-filled cookies made during the Jewish holiday, Purim. 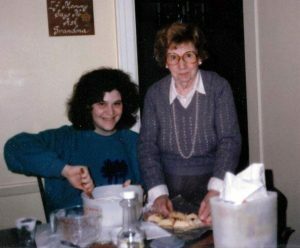 When I was a child, she taught me my Bubbe’s (great-grandma’s) recipe, and we made the cookies every year. And every year, Grandma admonished my mom, who laughed as she struggled to make the triangle shape and never got it quite right. Family traditions! As Grandma got older, I did more of the work and she supervised. After she died, I continued the tradition, and I even taught Ben how to make them. He loved doing it, and got a kick out of knowing that he, a Puerto Rican, was better at making humentashen than my mom! Every year, he would look up the date of Purim so he could tell me when we had to bake! And, just like Grandma did, we counted how many of each flavor I had. (Counting was a ritual she started as a joke because my dad used to sneak into the kitchen to take the matzah balls she made. ) As Ben’s ALS progressed, he made less and less, but he was always a part of the process, even as the official batter taster. Grandma never knew Ben, but I believe that she watched over us and that she would have loved him. I kept and used her mixer until it finally broke, and I still use her huge wooden rolling pins. 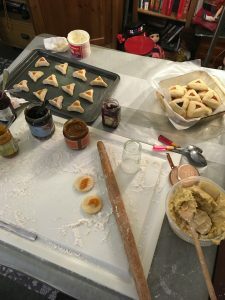 Making humentashen is a tradition that started a long time ago! I made humentashen today, on her birthday, because Purim is next weekend. It could very easily have made me feel terribly sad and lonely. But, today I found comfort in the thought that it’s pretty perfect to be doing something on her birthday that created such a strong bond between us. And, for followers of my blog, I made them on the table I got that replaced Ben’s (click for post). It didn’t feel quite right, but I know he’d still be happy that I’m baking. Making humentashen on Grandma’s birthday, March 5. As Gramma Tala said, there is nowhere I go where Grandma is not with me. So are my mom and dad and Ben. It’s not always enough, and the truth is that sometimes it’s not even close to being enough, but it helps me to know that everywhere I go, and in everything I do, I carry them in my heart and in the person I am. I hope that I make them proud. Happy Birthday, Grandma. I love you and miss you. Thinking of Grandma	“Heigh-Ho, Heigh-Ho” A Caregiver’s March?